I love to play at Rummy Passion. I won Rs 45,000 in an hour. Game play is easy and lightning quick. Each month, I get good offers from them. Rummy Passion welcomes you to an amazing online Indian rummy experience. Now Celebrate, Play, Love & Win by being a part of the 100% legal, safe and secure Rummy fiesta. Registration is easy and FREE. 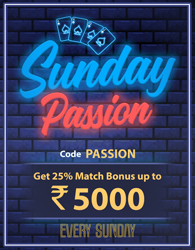 GET RS 10,000 MATCH BONUS - When you register and play for cash, you get a whopping Rs 10,000 as bonus money in the first week of your deposits. It does not get bigger and better than this.